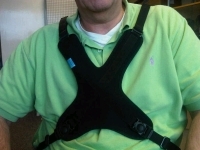 Butterfly Harness To Be Used With Wheelchairs. Butterfly Neoprene harness to be used with wheelchair. Please note that thes harnesses are not to be used as a replacement for car seat belts. Matthew offered me lots of advice on best products for our needs. The pull ups are excellent and much better than any we have previously used. Thank you for an excellent service. Really great harness , strong and comfortable . Quick delivery too.